This shop has been compensated by #CollectiveBias, Inc. and its advertiser, for the #HeroesEatMMs campaign. 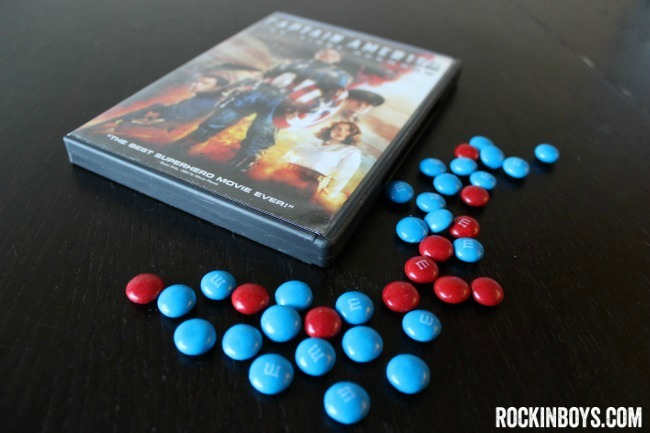 We love superheroes and we love M&M’s®, so we’re very excited to share our ideas for a really fun and simple Captain America movie night. School’s back in session and our daily lives are super busy again. While I love having two boys at school during the day, I also kind of miss having them around. It seems like our days are a whirlwind of me driving people around and then it’s bedtime. In an effort to carve out some time together I am totally implementing Family Movie Nights again. 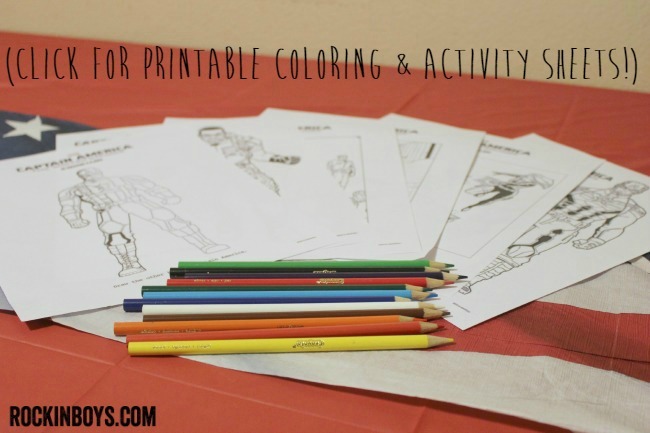 With simple themes I can throw one together in the few hours the boys are at school and everyone is happy. In honor of the upcoming DVD/Blu-ray release of Captain America: The Winter Soldier on September 9th, I chose Captain America: The First Avenger – one of our favorite origin movies – to watch together. I don’t know why but I love how they make Chris Evans look so tiny and scrawny before he gets transformed into the perfect soldier, Captain America. 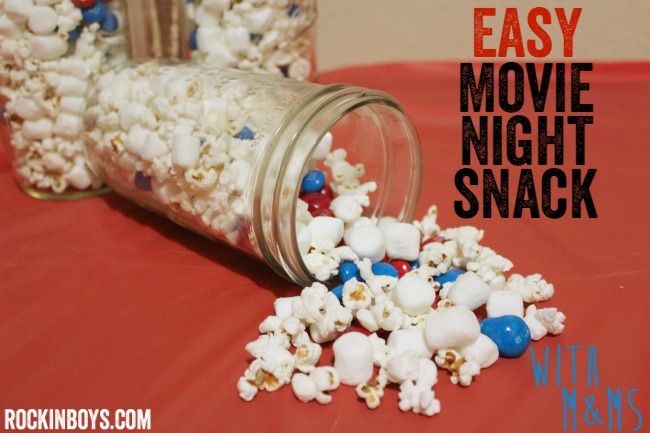 When you’re planning your weeknight movie party, you can totally do things throughout the day so that you’re ready when the kids come home from school. 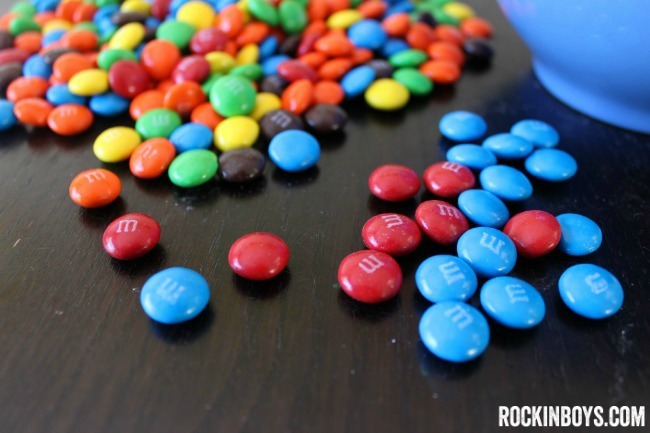 The first thing I worked on was separating the blue and red M&M’s for my movie snack. Then, I popped my favorite tiny popcorn so that it would be cool when I was ready to put the snack mix together. I grabbed some already made sugar cookies from the Walmart bakery and set up a cookie decorating station for after dinner. The best kind of dessert is the messy kind, obviously. 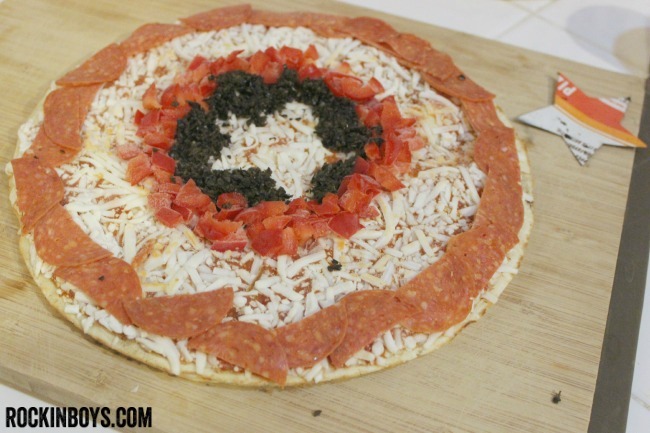 Another thing you can do ahead of time is make pizzas that look like Captain America’s shield. I don’t really have the time to fuss with homemade pizzas right now so I did some redecorating of a couple of frozen pepperoni pizzas. 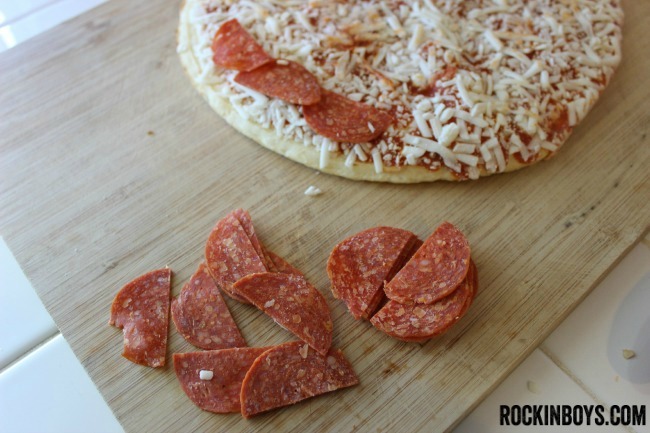 First, remove all the pepperonis and slice them in half. Use them to create the first red circle around the border of the pizza. 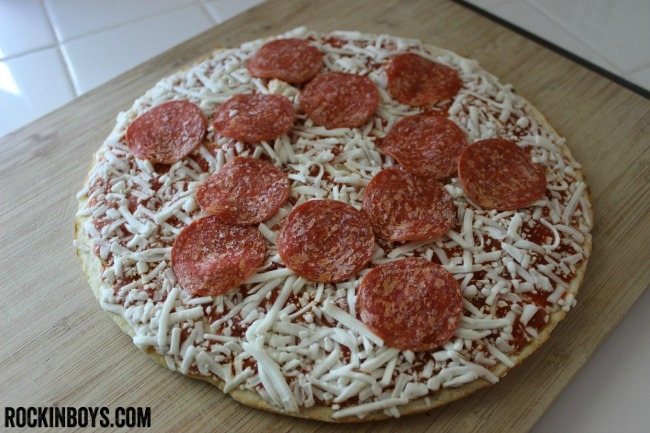 Next, place a cup upside down in the center of the pizza, sprinkle diced red bell pepper around the edge of the cup to make another perfect red circle. Some simple party accessories that I bought on clearance after the 4th of July were perfect for the theme. 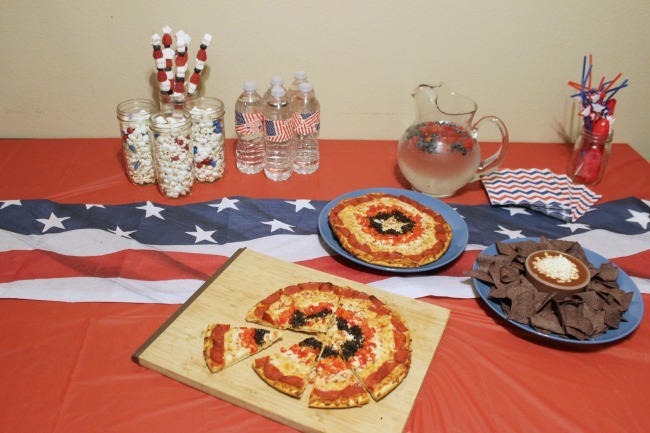 Patriotic chevron napkins, a red tablecloth with an American flag table runner, and of course all of the colorful food. I just love the way the pizzas turned out. The “nachos” were just blue corn tortilla chips around a bowl of salsa topped with crumbled cotija cheese. 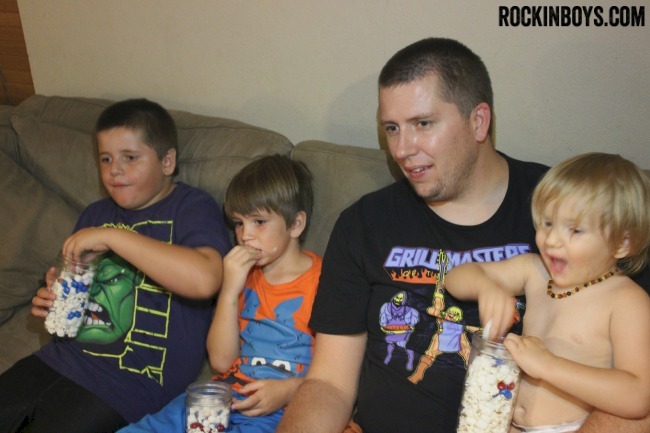 No need to get too fancy for a family movie night. 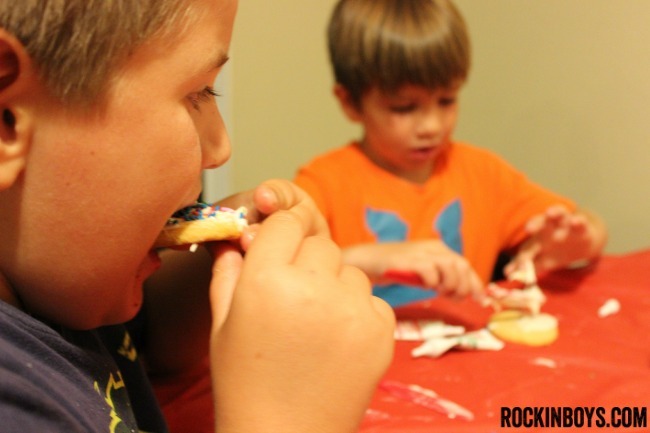 After dinner we decorated (and ate) some sugar cookies while Fun Dad got the movie ready. Then I handed out the fruit kabobs and movie snack mix to munch on while we watched. My super simple snack mix is one of the easiest M&M recipes ever. 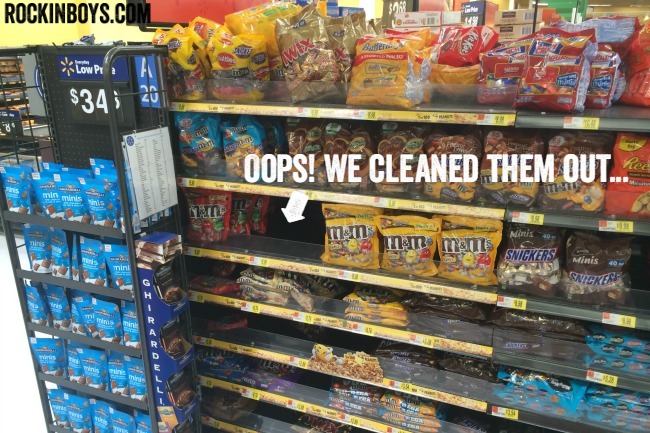 It’s just popcorn, mini marshmallows and our two favorite M&M’s flavors. (Milk Chocolate and Peanut Butter of course!) 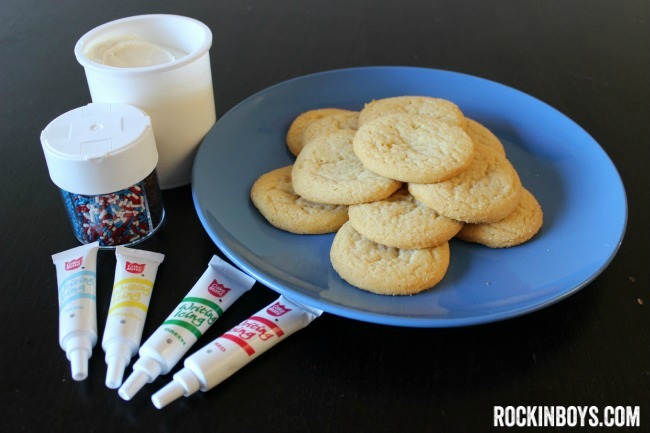 It’s the perfect light snack to eat while you watch. When you’re picking up your copy of Captain America: The Winter Soldier you can save $5 by grabbing two sharing-size bags of M&M’s from the candy aisle and a coupon from coupons.com. You don’t have to wait until the new Captain America is released to have this awesome movie night, though! 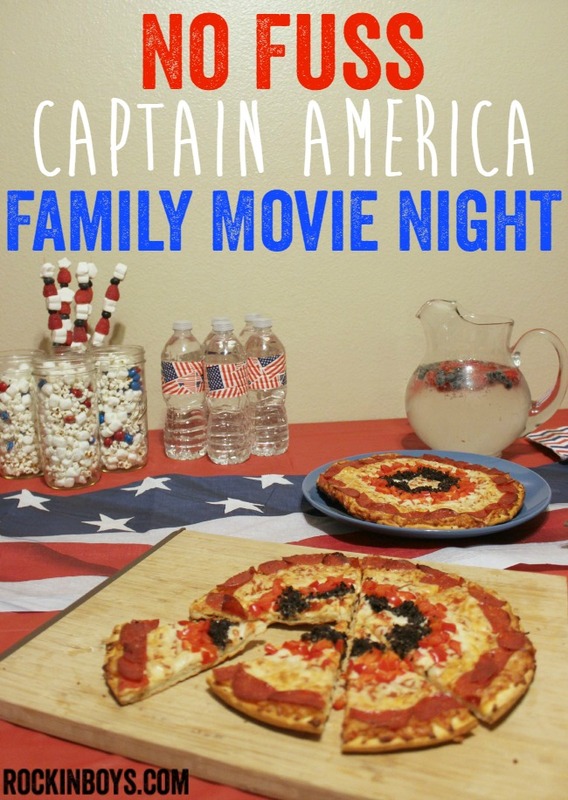 Throw on your favorite Marvel movie and enjoy an action-packed family night! Where do we get the coupon??? It will be live on coupons.com tomorrow! I’m looking into it and will let you know what I find out! What a fun party! 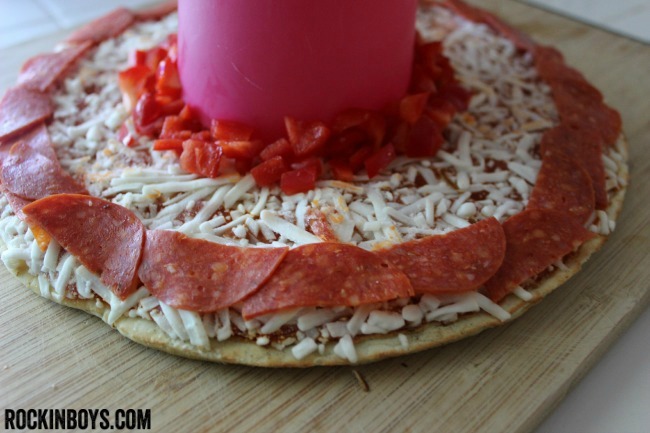 I’m going to make a pizza like that for my kids this week. They’ll love it, thanks for sharing! 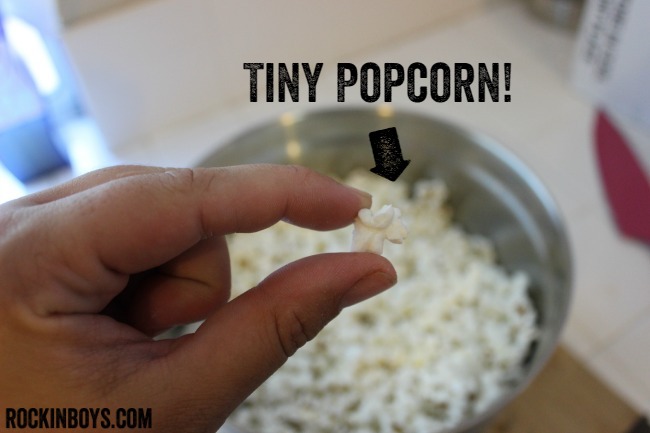 Tiny popcorn!? What! The coolest! Love this whole party. I bet your boys loved it!